Antique Clocks Guy: We bring antique clocks collectors and buyers together. Always the highest quality antique clocks available. terrestrial globe clock manufactured by Uhrenfabrik Carl Werner, Villingen as indicated by the logo on the movement. 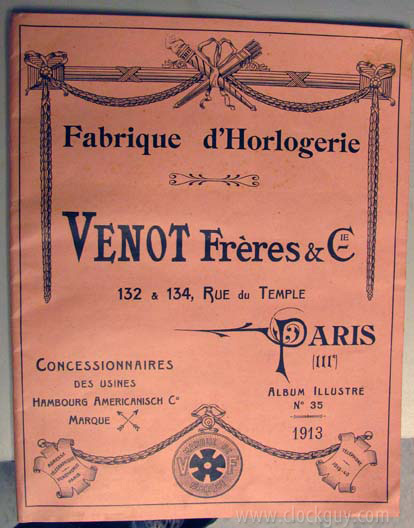 The company was founded in 1870 and even maintained an assembly factory in France. Werner was the largest movement maker in Germany until 1912, when the facilities burned down. The company was taken over by Kienzle in 1913, but we believe this clock is from earlier production, circa 1910. The terrestrial globe sits within an equatorial horizon band numbered with the hours of day, and with calibrated half-meridian, full solstice, and equinox bands, and with French labels on globe. Clocks are well suited to be combined with globes because world time is based on the full rotation of the earth once every 24 hours. To use the clock globe set the local time on the dial. Turn the globe so the place of use corresponds to the correct time on the equatorial hour circle. Local time for any place in the world then can calculated. Similar clocks are sometimes advertised as being made by Junghans (possible sales through Junghans?) but we think that is incorrect based on the movement markings with the Werner trademark. The 10” terrestrial globe, likely by Ludw. Jul. Heymann, Berlin, is in excellent condition. It rotates once in 24 hours via a drive shaft from the movement. Physical: The walnut arts and crafts-style cabinet with simple carving and beveled glasses is surmounted by a 10" diameter globe and measures 9"w x 24"h x 5.5"d overall. The markings on the 5" Arabic-numeral dial say "Patented" in German, English and French, indicating this clock was likely made for the export market. As you can see, the case is in excellent condition with original finish, original silvering on the dial, and original beveled glass. Mechanical: Most clocks of this genre run only 30 hours, but this is an 8-day clock. It runs well and keeps remarkably good time, having recently been professionally inspected and lubricated. 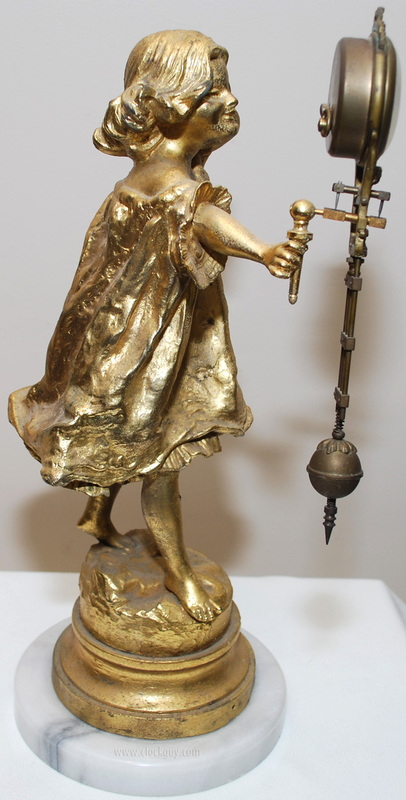 The movement, pendulum,hands and globe are original to the clock. Comments: We have provided you with significant information about this clock and a wonderful set of photos. Now, as time ticks forward, we await your call to make your own Werner acquisition! Questions? Contact us by phone at , or e-mail. CLICK TO SEE IT RUNNING! 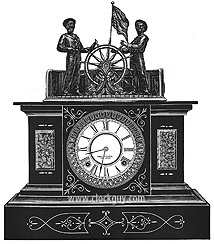 To our knowledge, this is the only clock that Ansonia categorized as a "Mechanical". 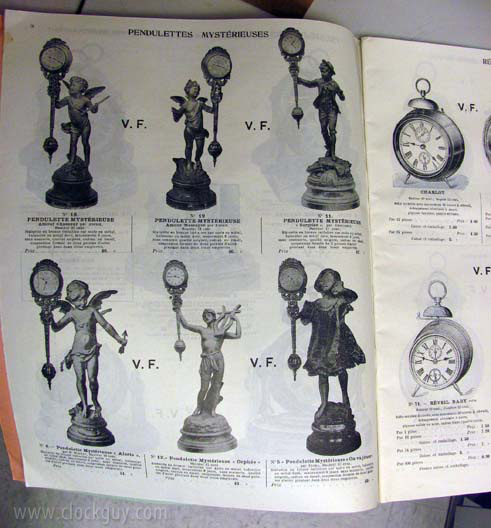 It was their answer to the French "Industrial" clocks (animated) that were all the rage in the late 1800s and occupies its own page in the book devoted to Ansonia clocks. While this model is very unusual to find at all, most of them don't work; this clock is a fine working example as you can see in the YouTube link. 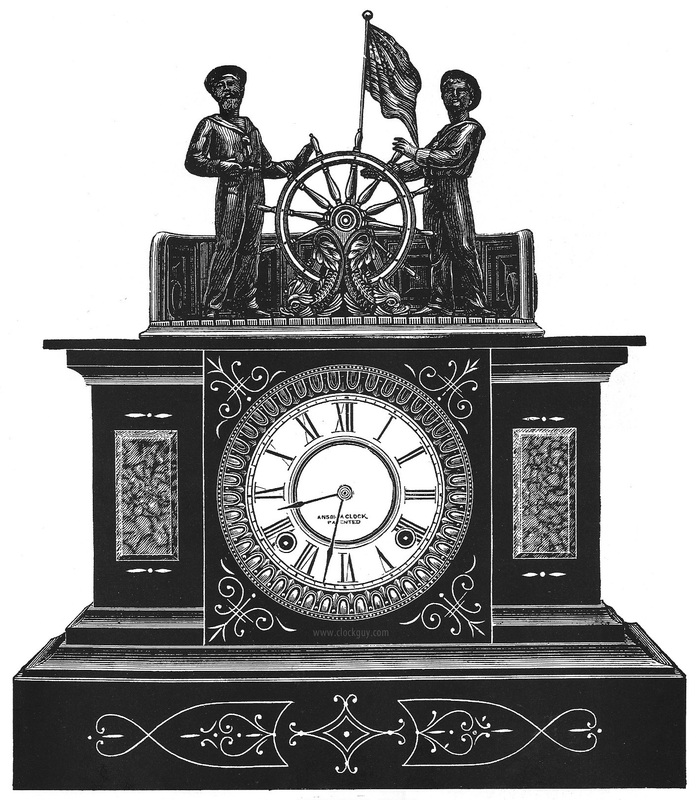 The black enamelled iron case is topped with two helmsmen with dolphins at the fore and flag at the stern. The ship's wheel moves back and forth between the hands of the sailors. Physical: The black iron case, which measures 15"w x 18.75"h x 6"d has been thoroughly cleaned and retains its original finish. The figures and other mounts are original to the case and retain their original finish. The 5.5" diameter signed (Ansonia and their logo) porcelain dial is in excellent condition and is original as are the hands. Mechanical: The eight-day time and gong-strike (half hour and hour) movement has recently been overhauled by a top professional. It is in excellent mechanical condition, keeping time and striking correctly. The ship's wheel correctly rocks back and forth in the opposite direction of the pendulum. As you see in the photo just above, from the top you can view the escapement as it moves the wheel. Comments: What a great clock! This one will be sure to attract much attention. Are you a yachtsman, or just an admirer? Doesn't matter. You and your family and friends will be enchanted with this clock. Ahoy, mate, give us a call to dock it in your port! Here's a way-cute small swinging-arm clock for your consideration that we had to pry from the hands of our adult daughter, who wanted to claim it for her own from our inventory! Physical: The gilded clock measures 6.5"w x 15.5"h x 6"d on the base and is in excellent overall physical condition. It is likely French in origin, and at one time had a small name plaque at the bottom (given the two small holes in the metal base). The statue sits on top of a white marble base. Mechanical: The 30-hour movement, with Junghans signature on the dial, was recently professionally serviced by our technician and is in good running order. It is important to know that small, pivot-based swinging arm clocks are not generally great time-keepers and they can be a bit finicky (but they sure are fun and always draw attention)! 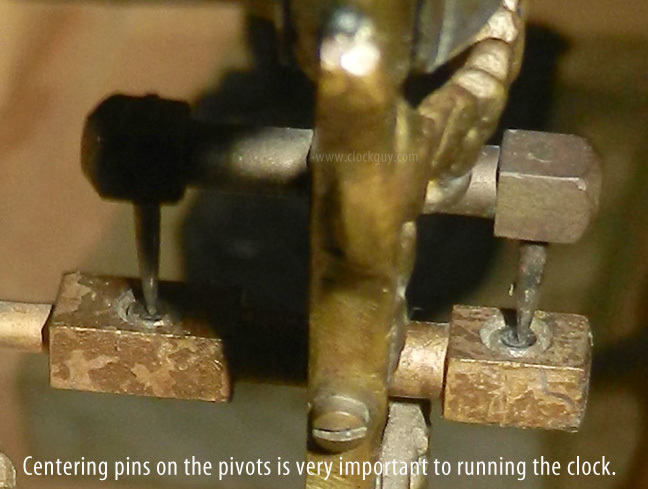 Precise placement of the pivot pins in the middle of the "sockets" in the horizontal pivot arm is extremely important to successfully running the clock. This photo shows both pins in place correctly. Comments: Beautiful little clock just waiting for that special place in your home... and heart! Give us a call at or send us an e-mail and let's discuss the clocks you have to sell. Whether you're a seasoned collector, an estate manager, possibly a "senior" collector looking to downsize in a "pre-estate" direction, or if you're just a beginning collector, we can help you like we've done for many others over many years. Please give us a call or drop us an e-mail note. You'll like the way we work and the way you are treated. Quality, Respect, Responsibility and Reputation are our business guidelines. All purchases from clockguy.com are subject to our currently posted Terms & Conditions of Sale.